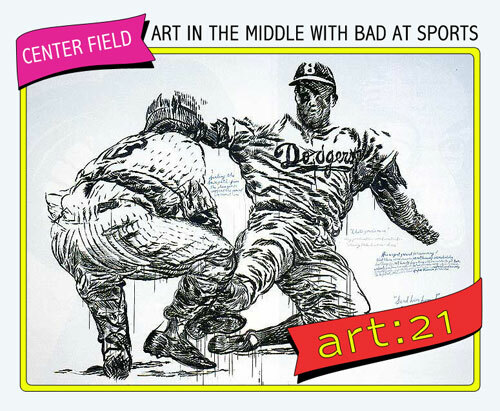 Itâ€™s time once again for Fielding Practice with Bad at Sports, a special podcast produced for the Art21 blog. On this monthâ€™s episode, Duncan MacKenzie, Dan Gunn, and I are joined by Abraham Ritchie, Chicago editor of ArtSlant, to delve into the wild world of art in Chicago and beyond. April was art fair month in our fair city, with the Merchandise Martâ€™s Art Chicago and NEXT fairs taking place over the April 29-May 1 weekend and the upstart MDW Fair organized by threewalls, Roots & Culture, and Public Media Institute rolling out the weekend prior to that. We debate the pros and cons of both fairs, whichâ€“although polar opposites to one anotherâ€“seem somehow to embody the strengths and weaknesses of Chicagoâ€™s own art scene at this particular moment. Next, we move on to a more theoretical, and certainly more speculative, discussion of an early Modernist revival among some of the artists weâ€™ve been looking at recently: from Ruby Sky Stiler, Mark Grotjahn, and Ryan Fenchel (artists who are featured in exhibitions this month at The Suburban, Shane Campbell Gallery, and Dan Devening Projects + Editions, respectively), to L.A.-based artists Amy Bessone, Aaron Curry, Thomas Houseago, and others. Click here to be taken to Art21 blog, where you can listen to the podcast and check out examples of the artists we discuss during the episode. Thanks for listening!